Mandip Kharod from TD FEF & Mark Wood, NSMBA Program Manager on Dreamweaver. On December 4th, Mandip Kharod from TD Friends of the Environment Foundation (TD FEF) joined Mark Wood, NSMBA Program Manager to see first hand the environmental improvements being made through the Trail Adoption Plan. TD FEF is a key supporter of the TAP program, donating $5000 in funding for operational costs, tool purchase, signage and builder payments. 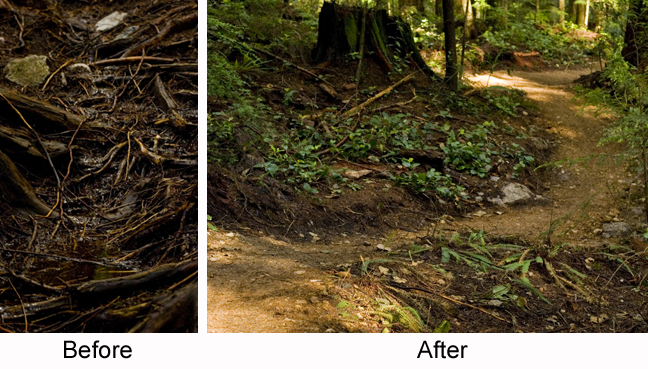 The site visit to Dreamweaver on Fromme illustrated the realignment of a significantly degraded section of trail that had some particular environmental concerns, as identified by the DNV and the NSMBA. The new alignment has increased the sustainability and lessened the maintenance required as well as minimizing our footprint as the old section has been decommissioned and reclaimed by the forest. Thank you to TD Friends of the Environment Foundation for the support and vision to improve the environmental conditions in our forests. An example of the sustainable improvements made thanks to the hard work of Arc'teryx and the support of TD FEF.